You’re the only you God made. If you aren’t you, we don’t get you. The world misses out. That is one of the statement taken from Cure for the Common Life that impacted me. 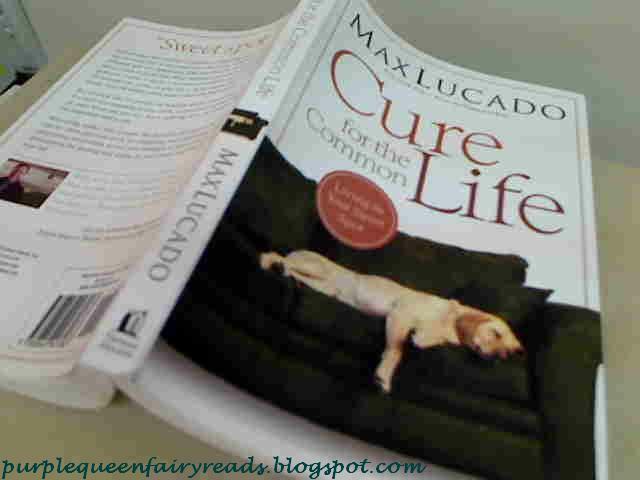 In this book, Max Lucado shares that we have a special uniqueness that God has made us for. ‘It is a zone, a region, a life precinct in which you are made to dwell.’ God tailored the curves of your life to fit an empty space in his jigsaw puzzle. According to Max, if we’re like 70% of working adults, we haven’t found our ‘sweet spot’ yet. We don’t find meaning in our work and we don’t believe our talents are used. What can we do? We’re suffering from the common life and we desperately need a cure. Written in the fashion of Max Lucado, this book is divided into three sections, Use your Uniqueness, To Make a Big Deal out of God and Everyday of your life. While it’s quite easy to read with Max sharing using examples from both the bible and the world, it is quite difficult for me to really understand what is is trying to share. While I got his message in general, I have difficulties following some of the teachings. At the end of the book, there’s a worksheet for readers to try to put into actions the techniques that Max shared in the book to find out ‘sweet spot’. Among the books by Max that I have reviewed in recent times, this is the one that I like the least as I can’t really relate to it. Perhaps, I am reading it at the wrong season in my life. Perhaps I need to read it again...sometime in the future...in His time. Cure for the Common Life is published by Thomas Nelson. Disclosure of Material Connection: I received this book free from the publisher through the BookSneeze.com book review bloggers program. I was not required to write a positive review. The opinions I have expressed are my own.